JOURNEY OF A BISHOP REPORT: French Jesuits were among the first missionaries to go to Canada and North America after J. Cartier discovered Canada in 1534. Their mission region extended from Nova Scotia to Maryland. 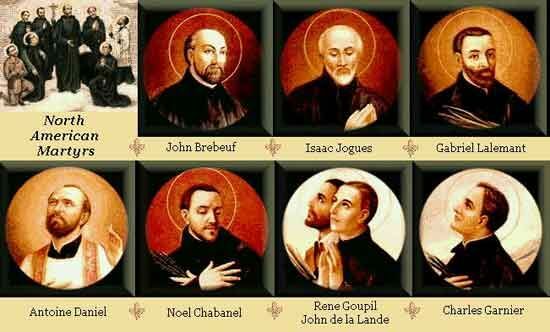 John de Brebeuf, Gabriel Lalemant, Noel Chabanel, Charles Garnier, Anthony Daniel, Isaac Jogues, Rene Goupil and John de Lalande (the first six Jesuits, the last two laymen) preached the gospel to the Iroquois and Huron Indians, and after being tortured, they were martyred. The martyrdoms took place between 1642 and 1649: Goupil in 1642, Jogues and Lalande on October 18 and 19, 1646 in the area of what is now Auriesville, New York; Daniel on July 4, 1648, Brebeuf and Lalemant in March 1649, Garnier and Chabanel in December 1649--all of these five in Huronia, near present-day Midland, Ontario. Ten years after the martyrdom of St. Isaac Jogues, Kateri Tekakwitha was born in the same village in which he died. These martyrs are co-patrons of Canada. The missionaries arrived in Canada less than a century after its discovery by Cartier in 1534, in the hope of converting the Indians and setting up "New France." Their opponents were often the English and Dutch colonists. When Isaac Jogues returned to Paris after his first capture and torture, he said to his superior: "Yes, Father, I want whatever our Lord wants, even if it costs a thousand lives." He had written in his mission report: "These tortures are very great, but God is still greater, and immense." "My heart tells me that if I have the blessing of being used for this mission, I shall go and I shall not return; but I would be glad if our Lord should fulfil the sacrifice where he began it, and that the small amount of blood I shed in that land should turn out to be an advance payment for that which I would give from all the veins of my body and heart." For two days now I have experienced a great desire to be a martyr and to endure all the torments the martyrs suffered.... I vow to you, Jesus my Savior, that as far as I have the strength I will never fail to accept the grace of martyrdom, if some day you in your infinite mercy should offer it to me, your most unworthy servant.... On receiving the blow of death, I shall accept it from your hands with the fullest delight and joy of spirit.... My God, it grieves me greatly that you are not known, that in this savage wilderness all have not been converted to you, that sin has not been driven from it. In 1999, the Canadian Conference of Catholic Bishops published a pastoral letter on the Canadian Martyrs to mark the 350th anniversary of the final deaths of these heroic priests in 1649. It may be accessed at: http://www.cccb.ca/site/Files/martyrse.pdf.